The success of Bizet’s opera Carmen has overshadowed the rest of his output, but this fascinating orchestral programme, which includes a number of seldom performed works, reveals more of his talent for writing colourful, atmospheric and melodic music. The Overture in A was Bizet’s first orchestral work and unperformed in his lifetime, while the Marche funèbre was originally the prelude to an opera about love and vengeance, now lost. The dramatic overture Patrie captures the mood following the Franco-Prussian war of 1870-71, while the Petite suite is a set of orchestrations of movements from Jeux d’enfants (Children’s Games). 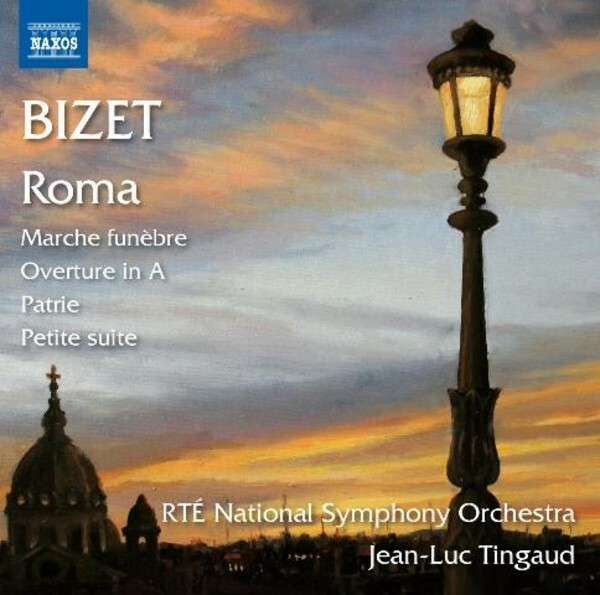 Conceived in Italy as a symphony, after Bizet had won the Prix de Rome, Roma occupied the composer for 11 years before the final version heard here. Jean-Luc Tingaud studied with Manuel Rosenthal, himself a pupil of Maurice Ravel. Concert engagements include the Royal Philharmonic Orchestra, English Chamber Orchestra, Ulster Orchestra, Orchestra of Opera North, Orchestra Filarmonica Arturo Toscanini, Orchestra of the Teatro Carlo Felice, Genoa, Orchestra of the Teatro Massimo, Palermo, the Warsaw and Kraków Philharmonic Orchestras, Orchestre National des Pays de la Loire, Orchestre National de Lyon, and the Orchestre National de Lorraine.